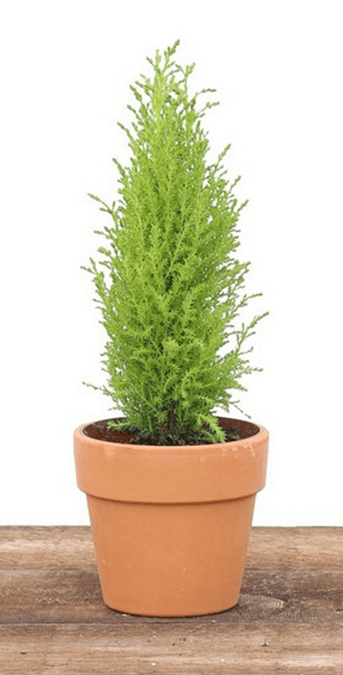 Serene and beautiful in design, live topiary plants grow best at a temperature range of 40° to 70° F. Weighing in at 1.25 pounds, this cone cypress topiary is sold in a 4.25 inch pot. This makes it the perfect size for night tables, kitchen counters or coffee tables. Since it performs well with indirect light, this fresh topiary plant does well in inside environments. For an additional cost, the bast can be wrapped in spring Mylar or it can be placed in a terracotta pot. Topiary plants are a very whimsical, green addition to any home. As a part of a home interior, they brighten the room and add a very lively ambiance. These plants can be shaped into spirals, animals or geometric figures as they grow, so they are completely customizable. With a bit of care, the live topiary plants can thrive vigorously for years. For the fresh topiary plants to look their best, they should be misted once or twice each week. This helps to boost the humidity around the plant and ensures that it does not dry out. When the topiary plant is watered, care should be taken so that it is not over-watered. Ideally, the first inch of the soil should be allowed to dry out before it is watered again. In addition, the pot that holds the topiary should have drainage holes to prevent water from sitting for too long. As the topiary grows, some adjustments may be needed to keep it looking its best. With a basic set of pruning shears, gardeners can prune any branches that are growing too long. To keep the cone shape looking bushy, the tips of the branches can be trimmed off. By doing this, the tree is forced to grow multiple branches out of the previous nodes on the clipped branch. Any stray or wayward branches can be tied closer to the plant using standard plant ties. By watering and trimming the fresh topiary plants, gardeners can ensure that their topiary retains its beautiful cone shape. With a history stretching back to the ancient Romans, this gorgeous plant is still a common sight in English gardens surrounding castles. Modern design concepts have reinvented the topiary, but it retains its historical elegance. Care Instructions: Keep soil evenly moist, but not wet. Prune regularly to retain shape.. Exposure: Bright, indirect light., Indoor Temp: 40 - 70 degrees F, Weight: 1.25 lb, Pot Size: 4.25 inches, Height: 12 inches. Topiary comes in plastic pot with no additional decor. Add a clay pot or mylar wrapping below. Learn more on how to care for your cypress topiary.